The Good Judgment Project (GJP) was the winning team in IARPA’s 2011-2015 forecasting tournament. In the tournament, six teams assigned probabilistic answers to hundreds of questions about geopolitical events months to a year in the future. Each competing team used a different method for coming up with their guesses, so the tournament helps us to evaluate different forecasting methods. The GJP team, led by Philip Tetlock and Barbara Mellers, gathered thousands of online volunteers and had them answer the tournament questions. They then made their official forecasts by aggregating these answers. In the process, the team collected data about the patterns of performance in their volunteers, and experimented with aggregation methods and improvement interventions. For example, they ran an RCT to test the effect of a short training program on forecasting accuracy. They especially focused on identifying and making use of the most successful two percent of forecasters, dubbed ‘superforecasters’. Tetlock’s book Superforecasting describes this process and Tetlock’s resulting understanding of how to forecast well. Roughly 70% of the superforecasters maintained their status from one year to the next 1. Across all the forecasters, the correlation between performance in one year and performance in the next year was 0.65 2. These high correlations are particularly impressive because the forecasters were online volunteers; presumably substantial variance year-to-year came from forecasters throttling down their engagement due to fatigue or changing life circumstances 3. Table 2 depicts the correlations between measured variables amongst GJP’s volunteers in the first two years of the tournament 4. Each is described in more detail below. As these data indicate, domain knowledge, intelligence, active open-mindedness, and working in teams each contribute substantially to accuracy. We can also conclude that effort helps, because deliberation time and number of predictions made per question (“belief updating”) both improved accuracy. Finally, training also helps. This is especially surprising because the training module lasted only an hour and its effects persisted for at least a year. The module included content about probabilistic reasoning, using the outside view, avoiding biases, and more. The forecasters who received training were asked to record, for each prediction, which parts of the training they used to make it. Some parts of the training—e.g. “Post-mortem analysis”—were correlated with inaccuracy, but others—most notably “Comparison classes”—were correlated with accuracy. 13 ‘Comparison classes’ is another term for reference-class forecasting, also known as ‘the outside view’. It is the method of assigning a probability by straightforward extrapolation from similar past situations and their outcomes. (3) Strike the right balance between inside and outside views: In particular, first anchor with the outside view and then adjust using the inside view. (6) Strive to distinguish as many degrees of doubt as the problem permits but no more. This example hints at another advantage of probabilistic judgments: It’s harder to weasel out of them afterwards, and therefore easier to keep score. Keeping score is crucial for getting feedback from reality, which is crucial for building up expertise. Bayesian reasoning is a natural next step once you are thinking and talking probabilities—it is the theoretical ideal in several important ways 21 —and Tetlock’s experience and interviews with superforecasters seems to bear this out. Superforecasters seem to do many small updates, with occasional big updates, just as Bayesianism would predict. They recommend thinking in the Bayesian way, and often explicitly make Bayesian calculations. They are good at breaking down difficult questions into more manageable parts and chaining the probabilities together properly. A major limitation is that the forecasts were mainly on geopolitical events only a few years in the future at most. (Uncertain geopolitical events seem to be somewhat predictable up to two years out but much more difficult to predict five years out.) 22 So evidence from the GJP may not generalize to forecasting other types of events (e.g. technological progress and social consequences) or events further in the future. Tetlock has ideas for how to handle longer-term, nebulous questions. He calls it “Bayesian Question Clustering.” (Superforecasting 263) The idea is to take the question you really want to answer and look for more precise questions that are evidentially relevant to the question you care about. Tetlock intends to test the effectiveness of this idea in future research. The benefits of following these best practices (including identifying and aggregating the best forecasters) appear to be substantial: Superforecasters predicting events 300 days in the future were more accurate than regular forecasters predicting events 100 days in the future, and the GJP did even better. 24 If these benefits generalize beyond the short-term and beyond geopolitics—e.g. to long-term technological and societal development—then this research is highly useful to almost everyone. Even if the benefits do not generalize beyond the near-term, these best practices may still be well worth adopting. For example, it would be extremely useful to have 300 days of warning before strategically important AI milestones are reached, rather than 100. Research, analysis, and writing were done by Daniel Kokotajlo. Katja Grace and Justis Mills contributed feedback and editing. Tegan McCaslin, Carl Shulman, and Jacob Lagerros contributed feedback. Technically the forecasters were paid, up to $250 per season. (Superforecasting p72) However their payments did not depend on how accurate they were or how much effort they put in, beyond the minimum. The table is from Mellers et al 2015. “Del time” is deliberation time. “Nonetheless, as we saw in the structural model, and confirm here, the best model uses dispositional, situational, and behavioral variables. The combination produced a multiple correlation of .64.” This is from Mellers et al 2015. This is from Mellers et al 2015. On the webpage, it says forecasters with better track-records and those who update more frequently get weighted more. In these slides, Tetlock describes the elitism differently: He says it gives weight to higher-IQ, more open-minded forecasters. The academic papers on this topic are Satopaa et al 2013 and Baron et al 2014. According to one expert I interviewed, more recent data suggests that the successes of the extremizing algorithm during the forecasting tournament were a fluke. After all, a priori one would expect extremizing to lead to small improvements in accuracy most of the time, but big losses in accuracy some of the time. This is from this seminar. For example, in year 2 one superforecaster beat the extremizing algorithm. 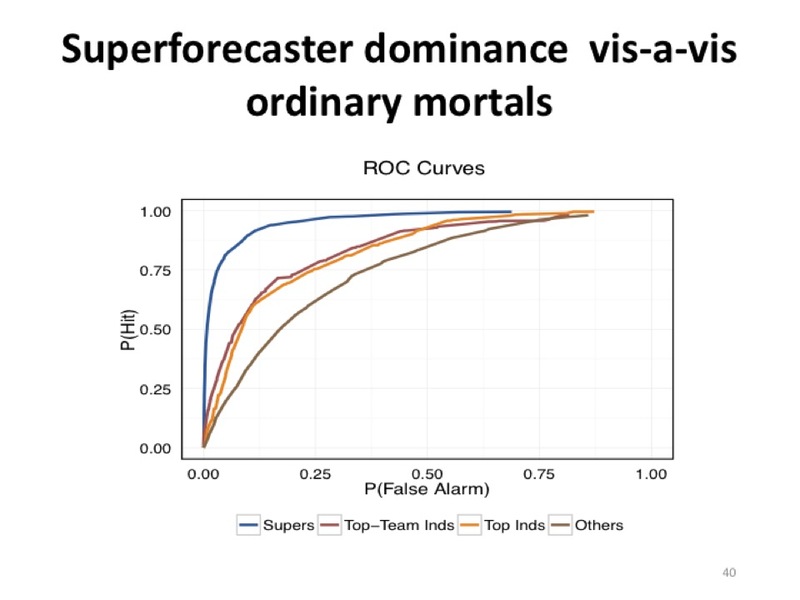 More generally, as discussed in this seminar, the aggregation algorithm produces the greatest improvement with ordinary forecasters; the superforecasters were good enough that it didn’t help much. This is from Chang et al 2016. The average brier score of answers tagged “comparison classes” was 0.17, while the next-best tag averaged 0.26. The superforecasters had a calibration of 0.01, which means that the average difference between a probability they use and the true frequency of occurrence is 0.01. This is from Mellers et al 2015. The fact about rounding their predictions is from Friedman et al 2018. For an excellent introduction to Bayesian reasoning and its theoretical foundations, see Strevens’ textbook-like lecture notes. Some of the facts summarized in this paragraph about Superforecasters and Bayesianism can be found on pages 169-172, 281, and 314 of Superforecasting. “There are several ways to look for individual consistency across questions. We sorted questions on the basis of response format (binary, multinomial, conditional, ordered), region (Eurzone, Latin America, China, etc. ), and duration of question (short, medium, and long). We computed accuracy scores for each individual on each variable within each set (e.g., binary, multinomial, conditional, and ordered) and then constructed correlation matrices. For all three question types, correlations were positive… Then we conducted factor analyses. For each question type, a large proportion of the variance was captured by a single factor, consistent with the hypothesis that one underlying dimension was necessary to capture correlations among response formats, regions, and question duration.” From Mellers et al 2015. Superforecasting p94. Later, in the edge.org seminar, Tetlock says “In some other ROC curves—receiver operator characteristic curves, from signal detection theory—that Mark Steyvers at UCSD constructed—superforecasters could assign probabilities 400 days out about as well as regular people could about eighty days out.” The quote is accompanied by a graph; unfortunately, it’s hard to interpret.